This is the fourth in a series of blog posts about two conferences I attended this fall (NCDD and NYSDRA). I started by describing the Red-Blue Dictionary and the exercise I designed for it (which I call "Ground Truthing with Stories"). Then I described a new conferences-and-meetings variant of the "Twice told stories" exercise, called "Bubble up stories," I designed for a NCDD plenary session. Then I described a "Sticker stories" landscape exercise I designed for a session on story work. Now I'll talk about Cross method mapping with the Group Works cards. As some will remember, I first started thinking about a way to connect the hundreds of methods and approaches that surround the practice of dialogue just after the 2014 NCDD conference opened my eyes to what I had been missing. I wrote about a "translation dictionary" I would like to create, to connect the approaches listed in various places in a more vital and substantial "matrix of meaning" than can be found when methods are simply compiled into lists (as valuable as that can be). I held this idea in my mind for a year or so. I talked with probably 20 people about it, and I got a few people to try some experiments reaching out from one approach to another. Last spring I wrote about the evolution of my thinking on the idea, describing one such attempt to reach out. In that blog post I mentioned the Group Works deck in my list of method lists. Some of the people in the Group Works team saw my post and responded to it. In particular, they corrected my misstatement that the Group Works deck is a list of methods. It's not a list of methods; it's a list of patterns that lie under all of our methods for bringing people together. This initial contact prompted a weeks-long discussion (on their mailing list) in which I discovered that the reasons behind the creation of the Group Works deck were very similar to the reasons I had been thinking about a translation dictionary. During the discussion I realized that the "matrix of meaning" I was looking for had already been created. So I started thinking of ways to use the Group Works deck to help people reach out across the spaces between methods. Because it was such a productive discussion, I'd like to show some of it to you. This is a selection of the comments (from myself and others) that led to me connecting so strongly to the Group Works deck as a matrix of meaning. I've set apart the things other people said as quotes; everything is edited for length; the whole conversation is colored in blue (so you can tell when it stops); and I've bolded the words that seem most significant as I look back on it now. I have considered the idea of creating a "matrix of meaning" in which various methods could "be suspended." Such a matrix could provide bridges between methods by its very existence, as air provides the means for sound to travel. Here's an idea: what if the Group Works patterns were the matrix? What might be useful would be creating a 'decision tree' for methods. What critical questions do skilled group process leaders and facilitators actually ask themselves when deciding which method to use? My guess would be that the decision criteria each facilitator uses are often irrational and sub-optimal, but that it would be difficult to change their method choices even if the 'decision tree' prompted them to do so. We all get familiar with certain methods that seem to have worked better for us, so we are inclined to use them instead of possibly better methods most of the time. What I've been thinking is, if people had a way to take "baby steps" away from their familiar methods, steps that made sense to them along lines of connection that felt important, people might begin to explore more opportunities. I see it as a particular responsibility of method keepers to balance promotion of our methods with attention to integration and cooperation. I don't want my method to "win" in a competition; I want to help people enlarge the range of tools they have at hand. This theme of getting past the methods is exciting for me - when we were working on it [the Group Works deck, I assume] I referred several times to one of the goals as "facilitative Jeet Kune Do" (Bruce Lee's attempt to forge a martial art that went past the surface forms and was more fluid, spontaneous, and flexible). What if skillfulness is not really about capacity with methods, but the underlying capacity to manipulate the overlying patterns? If so, what would a framework that could use methods as a means for patterns capacity building look like? If the facilitator is a chemist, my idea is probably seeing beyond the compounds in order to reach the periodic table. It doesn't override the utility of compounds, but it definitely changes the way we think about the compounds. I really like this metaphor of the periodic table. What I have been looking for is a way to move from one compound to another through the mediating matrix of the periodic table. I can see that you (as a group) have already thought about this a lot, which is why this discussion is so interesting. Each new pattern awareness or method brings up small Pandora's boxes which may be relatively manageable if the participating facilitator-student can intuitively, as well as rationally, appraise their own process, listen to their feelings at each step, and notice their emerging needs as they hit the white waters of the "martial" art of facilitating somehow differently. For example, that last sentence was way too long. If the process-concept came in smaller bites, it might swallow and digest better. One need may be frequent pauses to reflect and re-evaluate, even possibly with ... a buddy. That feeling of being "stuck" in the methods we know (which we have all felt) implies inertia, or gravity, or a reluctance to travel. As I see it, there are two ways to help people overcome inertia and travel more widely. One is to help people become better travelers, and the other is to build better roads. How to avoid the trap of walking the all-too-familiar roads instead of the ones we may not even be taking into account, to fulfill the purpose of discovering the world? My very humble guess is that the way most facilitators go about this existential dilemma is 1) Trial and error: "I did method X with that group and it was a disaster, what could have worked?" and/or 2) Association: "Oh, "your" method Y looks like "my" method X. Could you tell me more about it?" I concur that a shift in assessment perspective can create the "safer ground" that significant learning requires. Shifting the lens through which we look can transform how we see "stuckness," how we feel about it and how we respond. By shifting our assessment lens from negative to neutral, from critiquing static behavior to viewing it developmentally--which means in context and over time--we can liberate the experimentation on which growth relies. And to take it a step further, shifting from neutral to positive emotions "broadens and builds" (Fredrickson, 1998) our capacity to learn, innovate, and connect with other learners that is not a momentary experience, but persists and enables our individual and collective capacity going forward. Like this conversation. We're building some safety. We allow a bit of vulnerability, open up our hearts through empathy, and the collective field capacity increases. I like the phrase "liberating experimentation." That's what I'm talking about - bringing a greater opportunity for low-intensity, everyday, just-fooling-around play to how we think about helping people do things together. As a beginner, it's often very effective to mirror the behavior of more fluent practitioners. This is how we learn a native language, how to dance, carpentry, or facilitation. It's a learning mode that works. For beginners. Once we know the basics, it's time to improvise, being fully in formed by our previous knowledge. It could be really interesting to do a workshop on facilitative methods using Group Works [to] showcase some of the best maps that have been put together so far for a bevvy of methods. It would be interesting to see the feedback from folks who were familiar with a given method as well as that from those who weren't. And then the conversation wandered off onto other things, but I already had enough to work with. After this conversation I was sure that what needed to happen before the resource I envisioned could be created was the creation of a process that helped people take their first baby steps out of their comfortable method spaces. To do that I needed to help people create new connections in a spirit of empathy, safety, and play. What I needed was a game. So I started playing games with the Group Works cards. The first thing I noticed was that the Group Works people already have a game-like process in which people choose cards to represent and discuss any approach or method. They call it "Method mapping" and have been using it for years. During our discussion on the Group Works mailing list, somebody posted, as examples, some lists of Group Works cards people had chosen during four different Method mapping workshops. I copied those lists of cards into a spreadsheet, then chose some cards to represent a method I know well (PNI). Then I started juxtaposing the lists, putting them next to each other. The first thing I wanted to do was count how many cards each pair of methods had in common. I thought that doing this might give me a sort of similarity score. It did. But as soon as I saw the similarity scores, I realized that they were boring and stupid. What I really wanted to know wasn't whether methods were similar, or how similar they were. I wanted to know why. So I started to jot down some notes on why each card was chosen to represent each method. I went through the lists of cards and asked myself: "Why this card?" For cards chosen to represent the other method in each pair, I asked myself: "Why not this card?" Then I compared the lists of reasons. This was far more satisfying. All sorts of intriguing questions opened up about where each method came from and where it wanted to go. I started to see more deeply into the values behind the methods, into their backgrounds, aspirations, and assumptions. Surprising things started to happen. Two methods that appeared to be similar at first glance might come from different values and beliefs, and two methods that seemed different might be working toward the same goals. A card held in common might highlight a difference between methods, and a card chosen for only one method might bring up a similarity. Appreciation: AI came out of (thus emphasizes) situations where "what is going on" has already been "talked to death," and nobody is thinking past well-known problems. Commitment: AI encourages people to move forward into a more positive future by appreciating the things that are already working but have been ignored by too much focus on problems. Common ground: AI focuses on helping people find common ground by discovering their shared hopes, dreams, and assets. Appreciation: PNI came out of (thus emphasizes) situations where people have not yet had the freedom to choose and the right to be heard; thus to find out "what is going on" people must first be heard on their own terms. Commitment: This can happen in PNI, but PNI is designed to work well in low-participation and low-commitment situations as well, partly because those who know "what is going on" have not yet been heard. Common ground: This is a good emergent outcome of PNI, but it is not a requirement, because sometimes people are not yet ready for it. PNI focuses on meeting people where they are, because where they are is often not known at the outset. That's just a few of the cards I considered as I compared the two methods, but I think it gives you a quick idea of their different goals and contexts. I've been aware of Appreciative Inquiry (as an approach to story work) for a long time. I've thought about its origins, context, and purpose many times before. But this exercise helped me to gain more insight into how PNI and AI can complement each other. Then it was suddenly June, and the call went out to submit proposals for the NCDD conference. At first it seemed like it wasn't going to happen, but then one day I got an email from Sue Woehrlin, one of the prime movers of the Group Works team, saying she'd like to give it a try. Hooray! We put together a proposal, and it was accepted. During the time between the proposal and the conference we managed to run through the process twice more. More of the nerdy barnacles got scraped off, and we were ready to bring the game to more people. The instructions for carrying out the process/exercise/game expanded from a few paragraphs into a 14-page workbook (with spaces to record what went on) that could be written on for face-to-face use or annotated for online use. Sue brought copies of the workbook and the Group Works deck to the session for people to use. Our blurb for the conference was as follows. You may have used the Group Works Deck to help you facilitate. You may have used it to understand D&D methods by mapping their essential elements. Now you can use the Deck to explore synergies between D&D methods. Join us as we explore cross-mapping, a process for bridging divides among methods. Together we will discover surprising similarities and differences across D&D approaches. You’ll have a hands-on experience comparing a method you know well with a method someone else knows well. You’ll gain a new tool to work with other practitioners developing custom facilitation solutions. We had ten participants, and we ran two concurrent games. One group considered Open Space Technology and Reflective Structured Dialogue; the other worked with Structured Dialogic Design and Non-Violent Communication. We had to shorten the exercise time (from 90 to 60 minutes) to allow time for an introduction and debriefing/feedback, but people were able to do a good part of the exercise and see what it was like. In our feedback session at the end of our time, someone said they had "increased curiosity" about the other method, "even though I was already full up" with methods. Somebody else said "this is a way to step outside your method and explore the spaces between." That was exactly what we were after. Based on feedback during that session, I went back to the workbook and improved it yet again. At this point I think the process is as streamlined as it can be. I also changed the name from "cross mapping" to "cross method mapping" (per Sue's suggestion), because without the word "method" it's harder to understand at a glance what the game is about. I invite you to download the workbook and play your own cross-method mapping game. No: I don't invite you. I challenge you to do this. If you advocate or support any approach or method that helps people talk or work or think together, find someone who can bring another method into the game, and reach out together into the spaces between. You will need 90 minutes; at least two people who know two methods; the workbook, printed or online; and two copies of the Group Works deck, printed or online. Here's a brief overview of what you will do. You'll split into two groups. Each group will choose 8-12 Group Works cards that represent the method they are considering. For each card they choose, they will write down their answer to the question "Why this card?" The groups will come back together into one group. Someone from each group will give a brief "bird's eye view" description of the method they are working with. You'll sort the cards chosen by the two groups into three categories: in common; only in the first method; only in the second method. Together you'll consider each card held in common between the two methods. You'll talk about what it means to each method and what it means that both groups chose it. You'll summarize what you've learned in writing, taking turns putting things into words. Together you'll consider each card not held in common. Whichever group didn't pick that card will answer the question "Why not this card?" You'll discuss similarities and differences, and you'll work together to write down a summary of what you've learned. You'll wrap up the exercise with one or more of four activities: reflect on what just happened; write a high-level comparison of the two methods; draw a decision tree that shows which method should be used when; or brainstorm a project that uses both methods together. I hope you will choose to take up this challenge. If you do, please send me a note and tell me how it went and what you found out. I would like to thank the people responsible for the Group Works deck for all the energy, cooperation, and creativity they have put into the deck over the years. Cross method mapping is only one of many activities people have created using the Group Works deck (you can find the full list on their web site). The fact that such useful activities can grow up in such short time frames attests to the value of the resource they have created. I would also like to thank several people from the Group Works mailing list for taking the time to play the game and provide useful feedback. The ten people who attended our session at the NCDD conference also played an essential part in helping us validate and improve the game. I've now participated in or watched people participate in the cross-method mapping game several times. Here's what I've learned so far. Let's get curious. The number one outcome of playing this game, so far, that I've seen in myself and in everyone I have seen play it, is an increase in curiosity. People come out of the exercise interested in learning more about another approach. That isn't a guarantee that people will follow up and put actual time into learning about another approach; but it definitely makes it more likely that people will find the time to do so. Imagine if everyone involved in group facilitation played a game like this once a month, or once a quarter. Would it have an impact on the way we collectively use the methods at our disposal? I think it would. Exploring our values. The second strongest outcome I've seen has been the exploration of values that lie behind methods, whether they are ones we know well or ones we have just heard about. It's easy to nit-pick about methods that seem to intrude on our turf when we know a method well. We've all done it. It's harder to keep up that stance when you have just explored the laudable values that lie behind other methods. Can hope be a bad thing? How about being heard, or being respected, or finding solutions together? The whole thing reminds me of this amazing video from Louis C.K. 's Horace and Pete show that everyone on this planet should be strongly encouraged to watch. Yes, there is a place for criticism. There is a place for evaluation. There is a place for debates over effectiveness. But we also need a place to engage in dialogue and bridge-building about the ways in which we help people engage in dialogue and bridge-building. Let's have a party (game). This exercise is not just a game. It's a social game. Its rules create a sense of fairness, because everyone has to do - and gets to do - the same things. There is a symmetry to the game that sets people (and methods) up as equals. If my method has ten thousand adherents and is supported by several well-endowed institutions, and your method has a blog post and a five-person working group, we still use the same cards, get the same amount of time, and articulate our reasons in the same plain language. Games partially suspend "the rules of the real" to create a paradox: the safe exploration of the unknown. Every approach to group facilitation asks people to take this step into the unknown. It's only fitting that we who ask them ask ourselves to take the same step. As part of my thinking about why we need bridge-building among bridge-builders, and what will meet our needs, I've been developing a sort of model that describes the journeys people take as they go through their careers helping people come together. This is based on my own experience and my conversations over the years with hundreds of people going through their own journeys. It seems to me that the typical journey goes something like this. 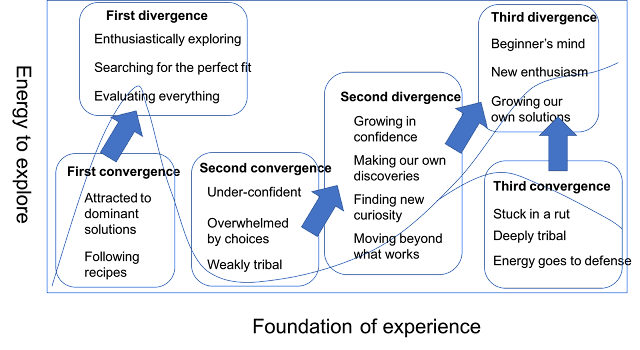 Everyone starts (in the lower left) with the initial convergence that attracts us to (or throws us into) the idea of helping people talk and think together. We are drawn to (or tasked with using) an obvious, dominant solution (because: there it is). We read books and manuals. We follow recipes. We make something work. Some people stay at this first stage for a long time because it's all they need. Others discover a hunger (or a need) for more, leading them to a first stage of divergence. They explore a few or several options with enthusiasm. They read several books and take a few seminars, searching for the method or approach that will fit their needs and aspirations best. But after a while, most people run out of energy and time to explore, and they settle on one or a few methods that fit their needs well enough. At this point people often become weakly tribal, in that they will defend those methods in a debate, but they haven't thought about them enough to put forth a detailed argument. They might feel a little guilty that they haven't explored more, but they're tired and busy, and things are working well enough. As people keep doing group facilitation, they inevitably begin to accumulate useful experience. They develop unique insights that are valuable to others. Maybe they write about those insights. Maybe they give talks at conferences. Their confidence and curiosity grow together. They begin to wonder what else is out there. So they enter into a new stage of divergence, pushing out further, learning about methods that are not so obvious or dominant. They begin to see how different approaches might complement each other. They try a few experiments with method mixing. It is after this second stage of divergence that journeys seem to bifurcate. Some people progress to a third divergence in which they develop a true beginner's mind that is open to all ideas. People in this state keep discovering greater and greater enthusiasm to explore. Eventually they reach the point where they no longer speak of particular methods at all, but use their portfolio of understandings to create new and unique solutions for every problem. When I think of this state, I always think of that moment in 2001 (the internet says: no, 2010) where the guy says, "My God, it's full of stars." But the second divergence does not always lead to mastery. Sometimes people, having again become overwhelmed with complexity or difficulty, fall back into a new convergence which is more deeply tribal than the one that came before it. People in this state expend their energy on defending and strengthening their existing choices. Their previous short-lived burst of curiosity has done nothing but convince them that they've been there, done that, and got the t-shirt to show it. They look upon those who are still searching as deluded or confused, and they put their heads down and get back to work, using the tools they know to be effective. At this point I see myself in the second stage of divergence. I've only been doing this work for seventeen years, which seems like an instant compared to the careers of some people I know. I'm still curious about what else is out there, but I can't say I've developed the confidence or the breadth of knowledge to move beyond methods entirely. I seem to hear about another new method or approach every few months, and while I can't keep up, I continue to want to try. Being a method keeper drags you down in the space, simply because your time is taken up by maintenance of the thing you bear responsibility for. That's why I think method keepers have a particular responsibility to boost their curiosity despite (or maybe because of) their need to focus inward. The City of Old Emperors is full of method keepers, and sometimes I hear it calling me. 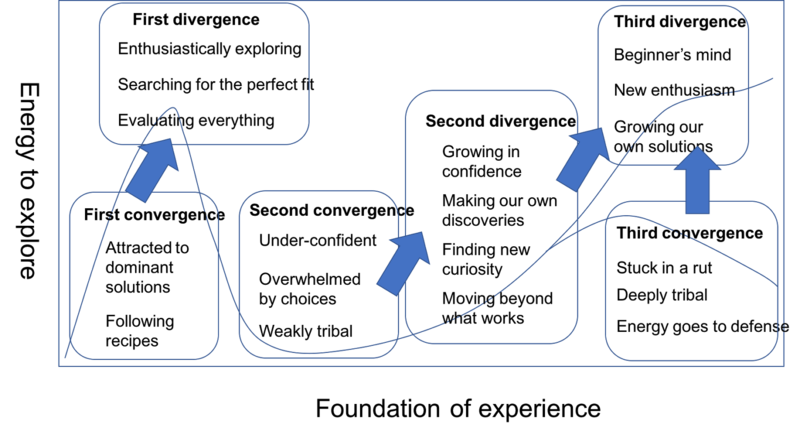 Anyway, I've drawn arrows on my diagram where I think the cross-method mapping game, and other games like it, can help people move up to better and more curious places. If you recognize yourself or your group as being in any of the convergent portions of my model, exercises like this one should be of particular value to you. One more thing about this model before I stop talking about it. As I was working on it, I realized that it reminds me of another model I've had in my mind for a long time (and indeed, maybe this one came from that one): a model of how people learn programming languages. Quite a few times I've needed to evaluate or interview people for programming tasks, and I've discovered that one question works best to find out where people are on their journey through the world of programming. The question is, "What is your favorite programming language?" The way people answer this question tells me more than any resume can say. If they say, "Well, I've only ever worked in" whatever language is in vogue lately, I know that they are in the initial stage of convergence, because they're using an obvious solution and haven't explored anything else. Of course, sometimes people are forced to use one solution or another; but people who have "caught the bug" of programming are rarely satisfied with that. If they talk about their experiences with three or four languages, I can see that they are in their first divergence, curious to find the one best language out there. If they know a few languages but exhibit weak tribalism about one of them (which you can always detect because their arguments for it don't hold up well to attack), I know that they have transitioned into their second convergence. If they talk about how they're still using mostly the languages they know well, but are intrigued by some of the new ideas coming down the pike, they're working their way into their second divergence. Those in their third convergence are the diehards who post long diatribes about the lost treasures of Lisp or the inimitable beauty of C++. Or they bristle at the joke "You can write FORTRAN in any language." Finally, the true masters of programming can write you out in five minutes a point-by-point decision tree populated with thirty languages you never heard of. And they write compilers on top of compilers for fun. People in all of these stages can do great programming work, and people in all stages of my group-facilitation model can do great work with people. But I ask people the favorite-language question because, if the person is in a convergent stage, they are probably going to need help if I need them to play with new ideas (and since most of my software work is in prototyping, I need people who can do that). I say this without prejudice, because in the field of programming I myself am in my second convergence and regularly need to push myself out of my comfort zone to program well. I was once fascinated by new languages, decades ago, but I've slowly settled down into preferring Python and grumbling about everything else (because Python is obviously superior, though I ... can't say exactly why). When I hire myself to do programming, I force myself to play some "try a new language today" games, tutorials and things, to push myself up into the higher-curiosity space. Otherwise any kind of rapid prototyping I might do will be pretty much doomed to failure. So I wonder if the same question might be useful to evaluate yourself as a group facilitator. What is your favorite method of group facilitation? Why? So, am I satisfied with this little social game? Does it scratch my itch? A little, but not enough. I'm excited by the emergence of the game, and I'm enthused about getting it out to people who can benefit from it. But it's not the whole solution to the problem. It can't be. The most obvious reason this game isn't good enough yet is that it isn't done yet. They say in the game development world that a game isn't finished until it has been played 100 times. By that measure this game has a lot of maturing left to do. But more importantly, even though the game can be played quickly and with a few people, and even though it's a fun, relaxing experience, it still represents a barrier to those who are reluctant to reach out beyond their comfortable places. That's a limitation that prevents the game from being the whole solution to the problem. I've spent a lot of time in my work with stories thinking about micro-participation, that is, how to get people to put two minutes or five minutes into a project they don't see the point of (at least at first). That's because the bottleneck in story work is never technology or expertise or time or money. It's the time and attention of the people who tell the stories. You can set up the most amazing project in the world, but if people won't talk to you, or they talk to you but don't pay attention and don't really tell you anything, you've got nothing. So I've thought a lot about barriers. A barrier can be a problem, because it turns people back from something that would benefit them and others. But a barrier can also be a solution, because it gives people a reward for the effort it took to breach the barrier. After you've passed the barrier, it no longer says to you, "You can't come in here." It says, "You are in! You succeeded! You are one of us!" So a barrier should be as low as possible, and no lower. I don't think the cross-method mapping game, or any other people-in-a-room-for-an-hour activity, is low enough to get people to learn more about other methods. More precisely, I don't think it's low enough alone. What else is needed? I keep coming back to my original idea of a resource, a place to play around with cross-method mapping a little at a time, on one's own, without talking to anyone. I keep seeing in my mind's eye something like a Google Earth for method space. I don't know about you, but I've flown around visiting all the places I've ever lived, or thought about living, or wished I could live. It's a blast. It's a kind of safe virtual travel into the past and into alternative universes where you never took that job or moved away from that house, or where you took that plunge you were afraid to take. I'd like to make something like that for group facilitation methods: a way to pan and zoom around in the world of group work, free of commitment, just surfing, a few minutes at a time, for fun. Oh, sure, people do surf in the lists of methods that are available. I don't mean to put down the substantial efforts people have put into their method lists. But there is something about a list that doesn't lead to meandering. It's like the difference between a garden path and a street in a cookie-cutter housing development: one surprises the traveler with serendipitous views, and the other catalogues life into pretty little boxes. We need boxes, but we need paths as well, and it's the paths I want and can't find. Some of the stuff I talked about in my earlier posts about this idea would still be needed to make such a map-like resource come into existence, whether people were playing the cross-method mapping game or not. Just like you can look at different time-stamped images in Google Earth, people need to see the history of each method and the context in which it was developed. Just like you need a map legend that puts everything in one scale, people need translation dictionaries that help them move easily between jargon spaces. Just like a satellite image gives you details, people need fleshed-out case studies that connect abstract descriptions of methods to real things that have happened to real people. What would make the game we have developed turn into the resource I think we need? Lots of people playing the game lots of times, plus lots of people taking the things they get out of playing the game and uploading them to a place that has places to put all of the things. What I've seen so far is that playing this game gets people ready to contribute to a resource like the one I envision. I can imagine people coming out of playing such a game, logging on to a web site, and adding what they learned about the methods they played the game with. I can imagine such a site growing over time until it reaches a critical mass for low-barrier method-space messing-about. I can imagine such a site complementing method lists in such a way that people walk around without even realizing that they've crossed from one mode of experiencing the world of facilitation to another. I can see two impediments to making this happen in practice. One: the effort would need a sponsor. Somebody would have to host and maintain and police such a site. I can't do that, because I habitually come up with ten times more plans than I actually have the time or resources to carry out. In fact, this blog post is probably as far as I can take this idea this year, on my own. So ... there's that. The other impediment is the harder one: participation. The effort would need champions, cheerleaders, people with outgoing personalities who are good at getting people to do things. I am not such a person. However, let us for the moment sweep those impediments aside and simply glory in the vision of a Google Earth for group work. I think we would like it. What say you? Coming up next: more conferences and meetings, plus what I'm doing after I finish writing these blog posts.
" The City of Old Emperors is full of method keepers, and sometimes I hear it calling me. " " You can set up the most amazing project in the world, but if people won't talk to you, or they talk to you but don't pay attention and don't really tell you anything, you've got nothing. " " We need boxes, but we need paths as well, and it's the paths I want and can't find. " Through years of teaching Permaculture in more of a creative spirit than in a mental PDC, I have created a few games myself and live with an open file in my mind, calling the creative flow. there are many places where one can swirl in a spiral. Hello Peter and thanks so much for adding a comment. Quite a few things in what you said resonate with me. "We have all been programmed to be too mental" - meaning, to me, too focused on reductionistic and even simplistic ways of looking at things (pretty little boxes). There used to be a greater ease with uncertainty and mystery in the way people lived. Of course we have reaped many benefits that we take for granted - antibiotics, technology, etc - so saying "we should live in mystery" on a computer is like saying "forests should be left standing" while living in a wooden house. ;) But maybe we can recognize what we have lost as well as what we have gained. I have also been exploring the connections between ancient sources of wisdom and contemporary needs. You might be interested in the project where I'm collecting frameworks of organization and self-organization similar to my confluence framework (see it under "Useful Things"). I am constantly looking for more "siblings" to add to my list of frameworks because I'm convinced that my list is incomplete. I'm not very familiar with Permaculture (aside from planting a new fruit tree or bush in my yard each year), so maybe you can suggest something from that perspective. I would also like to hear what you mean when you say you have "resorted to the 'quality' of things as a way of enticing people into group flow." Your comment reminds me of "Zen and the Art of Motorcycle Maintenance," which I read ages ago and really need to open up again. Anyway, curious to hear you expand on that thought.